The more bikes on the roads, the higher the chance of bicycle accidents. Drivers are often distracted as is—with changing their music, supervising their children and pets, and using their cellphones (even though they shouldn’t be)—so this creates a dangerous situation for cyclists. The scariest part is: In an accident, a driver is well-protected by airbags, seatbelts, and the metal shell of the car. A bike has none of those safety features. Cyclists are more prone to injury, which can result in pain and suffering, high medical expenses, and missed time at work. Similar to any personal injury case, every detail is crucial. If you’ve been involved in a bicycle accident with a motor vehicle, document the specifics—such as timing, location, road conditions, and situational details. If you’re hurt by a negligent driver, that motorist is at fault and responsible for any damages that ensue from the incident. In some cases, unfortunately, the negligent driver’s insurance may not cover the full extent of damages—because of insurance policy limits. But you can seek additional compensation through other means. 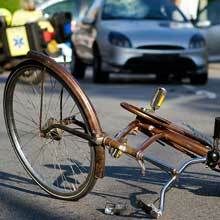 Please contact me if you’d like to know more about bicycle accidents and personal injury lawsuits in Washington. And follow this blog or sign up for my newsletter to learn about my DUI and criminal defense services. Thanks for reading!